The all-new Samsung Galaxy Note 4 has now been officially unveiled many countries in the world, the people of Bangladesh will have the chance to grab their copy soon. Samsung is seemingly worried about the launch of the iPhone 6 and the iPhone 6 Plus, and is said to be accelerating its release schedule for the Galaxy Note 4. With the aggressive pricing, Samsung is said to be targeting 15 million sales for the Galaxy Note 4 in the first month of availability, which if the manufacturer succeeds would overshadow the 11 million sales achieved by the Galaxy S5 earlier this year. Samsung Bangladesh is starting to take Pre-order for galaxy Note 4 through their website. While the regular introductory price is set for 80,000 taka ($1030), which is quite of the limit from previous Samsung product. For you knowledge Samsung released Galaxy S5 few months ago for 60,000 taka ($775) and Galaxy Note 3 a year earlier for 69,900 taka ($900). 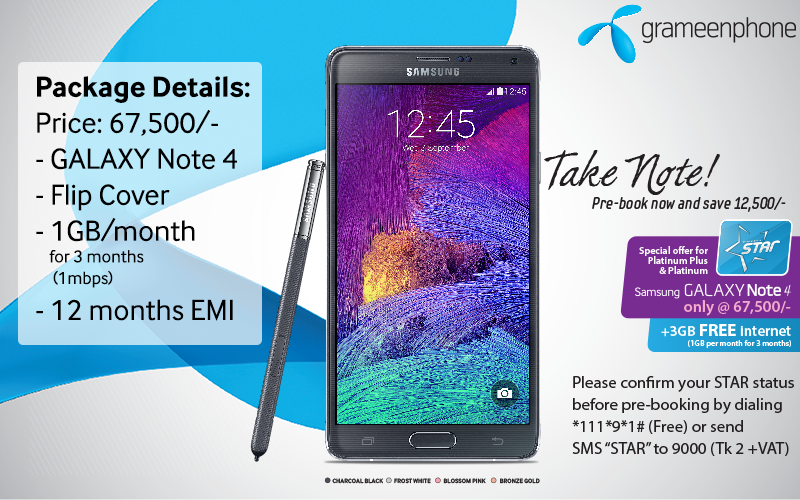 But if you are subscriber of Grameenphone Star then you have the opportunity to grab your Note 4 for 67,500 taka ($875). The exact release date of Samsung Galaxy Note 4 isn’t known yet.